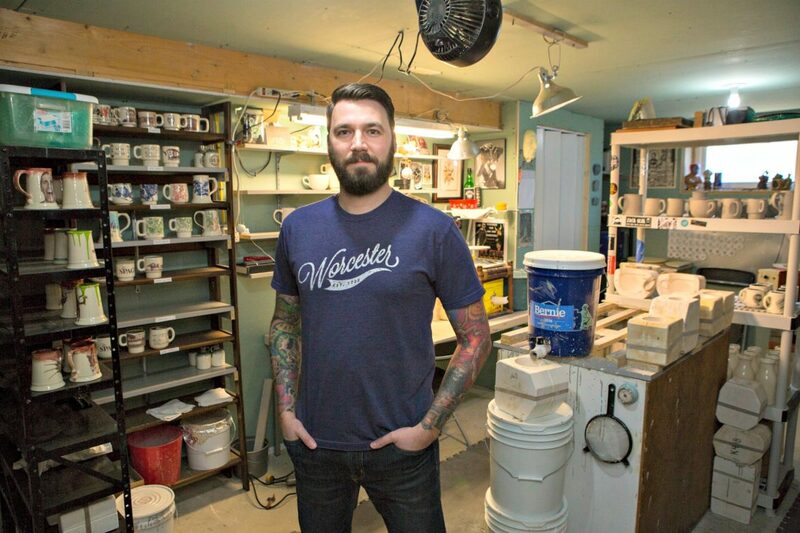 Jonathan Hansen, owner of Mugged In Worcester, poses in his ceramics studio. This article was originally published in the April 2, 2017, edition of the Sun. Worcester coffee drinkers and ceramic enthusiasts, beware. You’re about to be mugged. 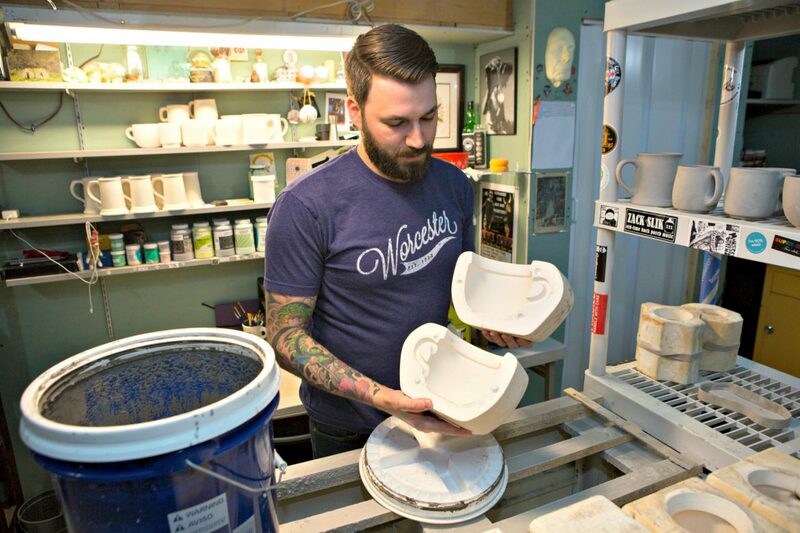 Mugged in Worcester, a ceramics company specializing in handmade, creative coffee mugs and beer steins, is making its mark across the city with Worcester-themed artwork showcasing landmarks like Union Station, Bancroft Tower and George’s Coney Island. “If you’re willing to take a step out and and take in the surroundings, you might fall in love with this city,” said Jonathan Hansen, artist and owner of Mugged in Worcester, when describing what inspired him to create art reflecting Worcester’s history and people. Hansen’s mugs also celebrate memories of iconic locations like the Miss Worcester Diner, Spag’s, Ralph’s Diner, Kelley Square, Paris Cinema and Hotel Vernon. The “whole thing” started in 2014, stemming from his personal connection with Worcester and an interest in, of all things, Tiki mugs. Hansen grew up in Pittsfield before moving to Milford — where his parents, Barbara and Wayne Hansen, still live — during high school. He is the youngest of three brothers. Todd, 48, and Brian, 47, moved to Worcester in 2007. For the past 10 years, Hansen, 40, has taught middle school art in the Mendon-Upton Regional School District. He graduated in 1999 from the Art Institute of Boston (now part of Lesley University) and majored in Fine Arts with a concentration in painting — while taking a few ceramics courses along the way. Since 2000, Hansen has been collecting Tiki mugs from various restaurants in the area, including the old Honolulu restaurant on Route 9 in Westborough (now a Bertucci’s), and exploring artists like Tiki tOny, Munktiki and Tiki Farm, Inc..
As Hansen began practicing the process and art of how Tiki mugs were made, he discovered slip casting, a technique of creating ceramics where liquid clay is poured into a plaster mold that allows an artist to make multiple objects from a single mold. Hansen working in his Whitinsville basement. In 2012, Hansen was commissioned to illustrate a mug for Tiki Farm for an Australian company named Mixxit. For two years, Hansen made hundreds of original designs including skulls, shrunken heads, berserkers and more. “Learning how to make two-part molds from my designs really solidified the idea of multiples and small-batch runs. I could make a hundred of the same design with variations of glaze color. This easily transitioned into using commercially made molds for the Worcester mugs and steins,” Hansen said. After going a few years without finding the success he had hoped to with Tiki mugs, Hansen found himself in a creative lull and was searching for a re-entry point in the world of ceramics. Hansen fills a casting mold. Thanks to a friend in Rhode Island who introduced him to a decal transfer process that allows Hansen to adhere any image to his mugs, and to working for a few years part-time as a tattoo artist at the Crown of Thorns Tattoo shop on Grafton Street — Hansen finally put the pieces together to start his own business doing what he loves. “I was always getting tattooed. In that community [Crown of Thorns], it’s really where I got my roots from in Worcester. Working there, I got to really know people and the city of Worcester. 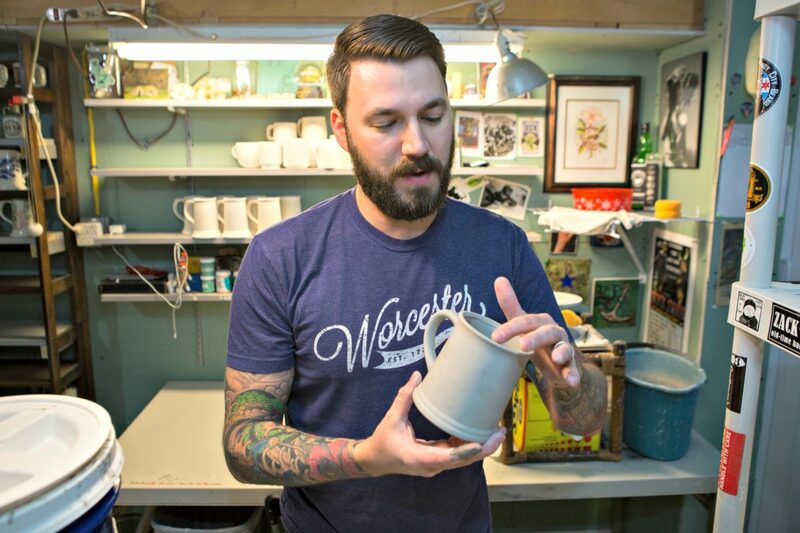 Ultimately, it made sense for me to create mugs about Worcester,” Hansen said. 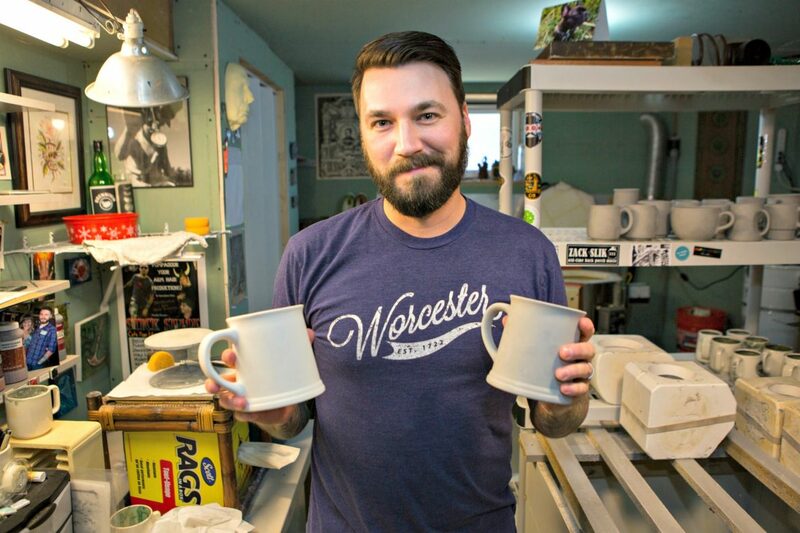 Hansen started Mugged in Worcester in the fall of 2014, and began selling his mugs at Worcester Wares and Crompton Collective during that Christmas season. “It’s a fun business to be in. It’s the first artwork I’ve made that people want to buy. That makes it really special to me,” Hansen said. Once Christmas hit, Hansen found himself putting in more time than he had expected — producing six to eight more mugs each week for two straight months. Hansen, with a formed mug. With the income from his first year in business in 2014, Hansen was able to buy an engagement ring for his wife, Heather Broman, a graphic designer and contributor to some of Hansen’s current Worcester designs. Hansen and Broman live in the Whitinsville section of Northbridge with their three dogs: Cricket, Harold and Maude. 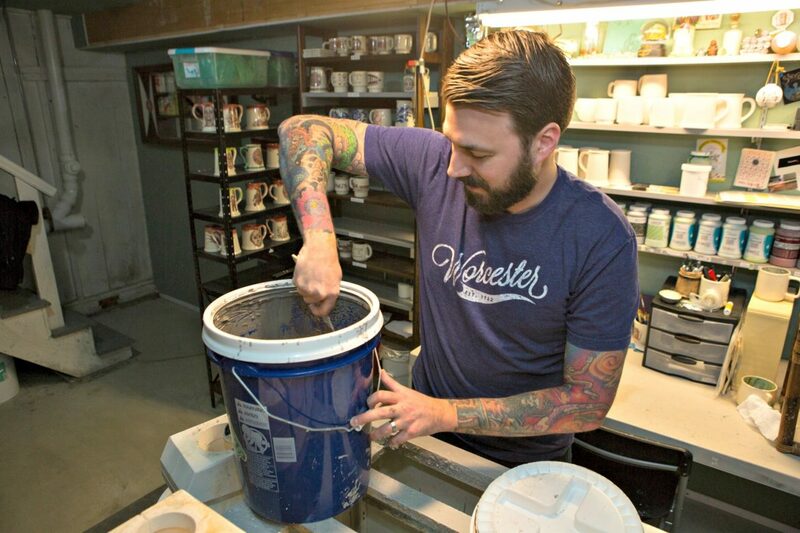 Since moving the business from his home in Webster Square in Worcester to the basement of his new home in Whitinsville in August 2015, Hansen has created more than 725 mugs — roughly 40 mugs per month. “I know someone who has bought five of them and uses one to drink coffee, a different one to drink tea, one as a pencil cup at work, another as a pencil cup at home, and another one on a bookshelf,” Walsh said. Over the course of two weeks, each of Hansen’s mugs go through three different firings. The first round is called a bisque firing, which heats the ceramic at a low temperature; the second is a glaze fire, after the mugs have painted; and the third firing is during the decal process to adhere photos or other artwork to the mug. 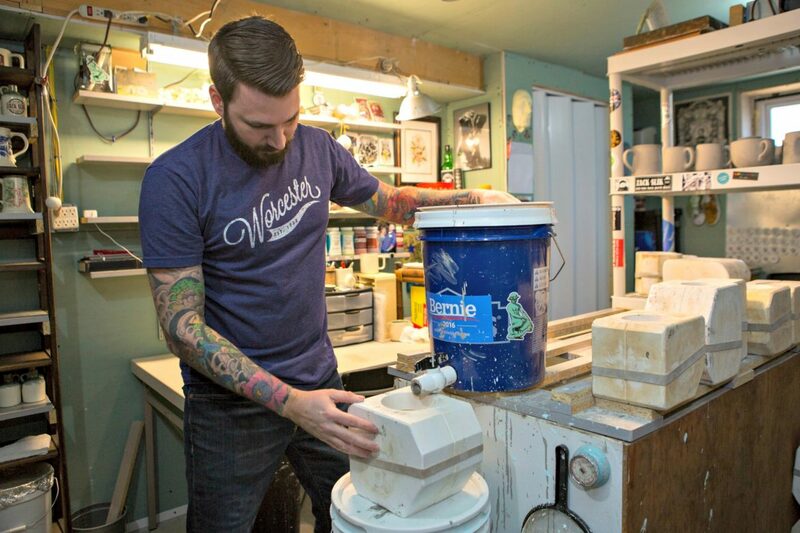 The studio contains a kiln that he can do a load of a dozen mugs at a time. Hansen skips the process of making the molds himself and instead buys commercial-grade plaster molds. “It’s a small-scale operation. It’s really not a full-time thing for me,” Hansen said. 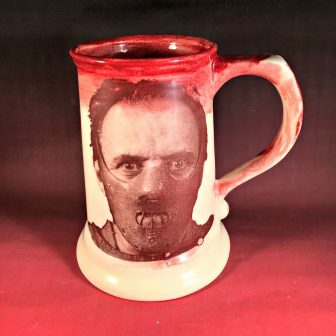 In September, Hansen expanded to a second enterprise with an unique niche: Horrorsteins — a “bloody branch” of Mugged in Worcester in which Hansen creates horror-themed ceramic steins. Many of the Horrosteins items sell very quickly on Etsy, Hansen said, because they’re one of a kind, limited edition collector’s items for fans of horror movies. “On top of the Mugged in Worcester stuff, this stuff has really taken off. There’s a world of people that enjoys these kinds of designs,” Hansen said. Hannibal Lechter, on a Horrorstein. Depending on the style, custom mugs are available at Mugged in Worcester for $25-$30 each. Hansen can use any clear photograph, drawing or logo for the mug decal. The custom mug process takes around two weeks for creation and delivery. According to Hansen, the most popular Worcester-related items include Ralph’s Diner, Spag’s and the Burnside Fountain’s famed “Turtle Boy” statue. “Jon makes each mug by hand and takes such care with each and every one. The process has many steps and it makes for a very wonderful, quality handmade item,” Walsh said. “I really enjoy seeing what he will do next. I love the ‘old’ designs, but I can never guess what he is going to do next, which keeps it interesting and fun. Visit Instagram to see more of Hansen’s Mugged in Worcester and Horrorstein collections.